Low salinity as a biosecurity tool for minimizing biofouling on ship sea chests Low salinity as a biosecurity tool for minimizing biofouling on ship sea chests Maria Cecilia T. de Castro et al. Biofouling is a major vector in the transfer of non-native species around the world. Species can be transported on virtually all submerged areas of ships (e.g. hulls, sea chests, propellers) and so antifouling systems are used to reduce fouling. However, with increased regulation of biocides used in antifoulants (e.g. the International Maritime Organization tributyltin ban in 2008), there is a need to find efficient and sustainable alternatives. Here, we tested the hypothesis that short doses of low salinity water could be used to kill fouling species in sea chests. Settlement panels were suspended at 1.5 m depth in a Plymouth marina for 24 months by which time they had developed mature biofouling assemblages. We exposed these panels to three different salinities (7, 20 and 33) for 2 hours using a model sea chest placed in the marina and flushed with freshwater. Fouling organism diversity and abundance were assessed before panels were treated, immediately after treatment, and then 1 week and 1 month later. Some native ascidian Dendrodoa grossularia survived, but all other macrobenthos were killed by the salinity 7 treatment after 1 week. The salinity 20 treatment was not effective at killing the majority of fouling organisms. On the basis of these results, we propose that sea chests be flushed with freshwater for at least 2 hours before ships leave port. This would not cause unnecessary delays or costs and could be a major step forward in improving biosecurity. de Castro, M. C. T., Vance, T., Yunnie, A. L. E., Fileman, T. W., and Hall-Spencer, J. M.: Low salinity as a biosecurity tool for minimizing biofouling on ship sea chests, Ocean Sci., 14, 661-667, https://doi.org/10.5194/os-14-661-2018, 2018. Biofouling is a major vector in the transfer of non-native species around the world (Carlton et al., 1995; Ruiz et al., 1997; Gollasch et al., 2002; Coutts and Taylor, 2004; Castro et al., 2017). Species can be transported on virtually all submerged areas of ships so antifouling systems are used. However, some areas of ships hulls, such as sea chests and chain lockers, are difficult to access and coat with antifoulants. Consequently, these areas often get heavily fouled by a wide variety of marine organisms such as hydroids, serpulid polychaetes, barnacles, mussels, bryozoans and tunicates (Coutts and Taylor, 2004; Murray et al., 2011). Non-native species introduction and spread is increasing, e.g. due to the opening of new trade routes, climate change and the increasing speed of vessels. The International Maritime Organization (IMO) decided to tackle this problem initially by adopting a set of voluntary regulations. In 2011, the IMO Marine Environment Protection Committee issued Resolution MEPC.207(62) outlining measures to minimize the risk associated with ship biofouling. These regulations are directed at many stakeholders (e.g. states, shipmasters, operators and owners, shipbuilders, port authorities, ship repair, dry-docking and recycling facilities, and antifouling paint manufacturers and/or suppliers). Two subsequent sets of guidance on biofouling have since been released: one for recreational craft less than 24 m in length (MEPC.1/Circ.792, 2012), and the second evaluating the 2011 guidelines for the control and management of ship biofouling to minimize the transfer of invasive aquatic species (MEPC.1/Circ.811, 2013; Castro, 2014). Following the Ballast Water Convention in 2017 coming into force, it seems probable that ship biofouling may soon become the subject of a new international treaty. In May 2017, a programme called “Building Partnerships to Assist Developing Countries to Minimize the Impacts from Aquatic Biofouling” (or “GloFouling Partnerships”) was approved by the Global Environment Facility to be implemented by the United Nations Development Programme and executed by the IMO. An implementation phase is scheduled to start in the second half of 2018 and last for 5 years (IMO Circular Letter No. 3768). In some countries, biofouling management plans and record books are already in place as part of national regulations (e.g. in the United States of America, Australia and New Zealand). For instance, in the state of California (USA), ship owner or operators of vessels of 300 gross tons or larger need to submit a hull husbandry reporting form (Scianni et al., 2013). Biofouling increases shipping operational costs and fuel consumption due to frictional drag: even microbial fouling, which is a precursor to macrofouling, has an effect. There are also the costs of hull cleaning and painting (Schultz et al., 2011; Dobretsov et al., 2013; Davidson et al., 2016). Some organisms (e.g. bryozoans and algae) are tolerant to antifouling compounds and can grow on freshly applied antifouling paint, and are subsequently used as a substratum for other species (Murray et al., 2011). With the ban of tributyltin in 2008, other antifouling systems started to be used, copper-based antifouling being the most commonly used nowadays. Apart from copper, booster biocides are also used in antifouling system despite their potential impacts on the marine ecosystems (Faÿ et al., 2010; Price and Readman, 2013). Glycerophospholipids from soybeans, for instance, are considered effective booster biocides in antifouling paint (Batista et al., 2015). Antifouling compounds from marine bacteria, cyanobacteria, fungi and eukaryotic organisms have also been developed as biocides (Dobretsov et al., 2013). In terms of mechanical tools to remove biofouling, Hearin et al. (2016) showed that mechanical grooming is helpful in reducing fouling on submerged surfaces coated with fouling-release coatings. Niche areas on vessel hulls (e.g. gratings and propellers) represent a great challenge to minimizing biofouling. On larger vessels, sea chests maximize seawater inflow (e.g. for internal cooling systems and ballast water). These box-shaped structures are difficult to access and coat, they have edges and welds that provide sheltered areas for organisms to settle and recruit (Coutts and Dodgshun, 2007). In Canada, a study of 82 sea chests from commercial ships showed that 80 % of them had fouling organisms and that almost half had non-native species (Frey et al., 2014). Setting biosecurity goals and implementing measures for controlling non-indigenous species helps to avoid their spread (Collin et al., 2015). In order to control biofouling in niche areas on ships, a simple and efficient treatment method is needed. Numerous methods are available, for example ultraviolet light (Titus and Ryskiewich, 1994), heated water and steam, (Leach, 2011; Piola and Hopkins, 2012; Growcott and Georgiades, 2016), or soaking areas in acids (e.g. acetic acid) or alkalines, such as hydrated lime (Rolheiser et al., 2012). In Alaska, the invasive colonial ascidian Didemnum vexillum was exposed to various treatments using acetic acid, bleach, freshwater or brine with 100 % mortality when exposed to freshwater for 4 h (McCann et al., 2013). In Brazil, Moreira et al. (2014) tested the use of freshwater to combat the spread of invasive corals Tubastraea tagusensis and T. coccinea. For both these species, 2-hour exposure to fresh water killed all the corals and this treatment is now routinely used to combat the spread of Tubastraea spp. on oil industry infrastructure. In New Zealand, Jute and Dunphy (2017) showed that 2-hour exposure to fresh water killed the invasive Mediterranean fan worm Sabella spallanzanii, while in hypersaline conditions of salinity 50, 100 % mortality was reached after 24 hours. Finally, two studies conducted in Plymouth, UK, showed that low saline treatments can be highly effective at reducing biofouling and can be used in conjunction with antifouling coating systems (Minto, 2014; Quinton, 2014). Although chemical treatments, the use of heat or the use of UV light all work, they can be costly or pose health and safety risks and also increase corrosion of hulls. On the other hand, freshwater is not dangerous but it is cheap and widely available. Given the importance of biofouling as a vector in the world transfer and spread of non-native species, this study tested the hypothesis that a rapid change in the salinity can kill fouling species taking into account the regulation of the osmotic pressure between the surrounded aquatic environment and the organisms body fluids, and offers a simple and efficient biosecurity management tool to minimize biofouling in ship sea chests. This case study was conducted in southwestern England and is representative of the fouling community of the northeastern Atlantic Ocean. An experiment was conducted in two phases: the first in November 2016 and the second in July–August 2017 in Millbay marina (50∘21′47′′ N, 004∘09′02′′ W), Plymouth, UK. The marina is tidal and open to Plymouth Sound, a large bay on the south coast of Devon (SW England) that is sheltered by an artificial breakwater (Bremekamp, 2012). A model sea chest was built to find out the lowest steady salinity that could be achieved when the chest was flushed with freshwater whilst submerged and open to surrounding seawater. The sea chest was a polypropylene 80 L container (external dimensions: 600×400×420 mm); 12 panels were fixed inside with stainless threaded rods to simulate gratings. A YSI 556 multiparameter meter, complete with conductivity probe, was hooked inside the box to measure salinity. The box was deployed so that the panels were vertical and about 1.5 m from the seawater surface; measurements of temperature and salinity started immediately after the deployment and were recorded every 10 s. To create a hyposaline environment inside our immersed sea chest, freshwater was flushed into the box through a hose connected to a tap on the pontoon. A flow rate of approximately 8 L min−1 was kept during the experiment bearing in mind the necessity of preventing excess turbulence inside the box. Flow was suspended after 86 min when the salinity stabilized and the probe stopped recording 5 hours later. As for shipboard tests, logistics prevented us from carrying out these experimental trials on board and with a view to increasing replication for our tests we opted for the model sea chest. Polyvinyl chloride (PVC) settlement panels (each 12×12×0.5 cm) were deployed in the same marina more than 2 years before the experiment, in June 2014. Initially they were fixed in grids horizontally orientated with the roughened side facing outwards, ar a depth of approximately 1.5 m, avoiding sedimentation and algae growth (Quinton, 2014). Five months before the low salinity experiment, panels were rearranged in a vertical position tied to a rope and attached to the pontoon. At this stage, panels were less exposed to the light, almost under the pontoon which also helped to preclude macroalgae. Fifteen of these panels were selected based on the existence of a well-developed fouling community, including the native ascidian Dendrodoa grossularia on all panels and the non-native encrusting bryozoan Watersipora subatra on most of the panels. The objective was to examine the effects of low salinity water treatments on the whole community assemblage on each panel. Panels were subjected to one of the following salinity treatments: 7, 20 or control (33) for 2 hours (five panels per treatment). The lowest salinity (7) was chosen as it was the lowest steady value achieved inside our simulated sea chest. The exposure time was chosen based on the studies conducted by Moreira et al. (2014) and Jute and Dunphy (2017). On the day before the experiment started, water from the marina was collected and stored at a constant room temperature of 16 ∘C at Plymouth Marine Laboratory similar to the temperature found in the marina. The water used to prepare the different salinity treatments during the experiment was a mix of local sea water and pure fresh water (Milli-Q water), stored in the same room. An acrylic 12×12 cm quadrat divided into a 1 cm2 square grid was used to enumerate organisms on the settlement panels. The apparatus (settlement panel and quadrat) were submerged in seawater in a Pyrex dish for analysis. At each intersection point on the grid, organisms were identified, where possible to the species level. Each taxon was enumerated, with colonial invertebrates counted as one maximum per square. Analysis times were set to a maximum of 25 min in order to minimize stress to the organisms. Panels were evaluated regarding the abundance and mortality of fouling organisms before exposure to one of the treatments, immediately afterwards, and on two more occasions: 1 week and 1 month after. Mortality was assessed by, for example, detachment of the organisms from the panels, a lack of response (e.g. tunicates with no reaction when siphons were touched), absence of zooids in erect bryozoans, or alterations in the texture and/or colour of the organisms. Data from fouling communities were entered into PRIMER-E for abundance analysis and were square root transformed prior to clustering analysis according to Clarke et al. (2016). The first phase of the experiment was to ascertain the lowest salinity that could be maintained inside our simulated sea chest. The salinity was initially 32, decreasing to 24 after 25 min, to 9 after 60 min before stabilizing at 7 at 86 min. Once the freshwater supply was switched off, the salinity inside the sea chest increased slowly over a 5 h 20 min period to 27.3, when the recordings ended. During this time (November), the water temperature varied between 13 and 13.6 ∘C. Biofouling communities were similar on panels before and immediately after treatment but thereafter there were marked differences since low salinity treatments killed most of the organisms present. Cluster analysis of the biofouling community composition 1 week after the treatment showed that panels submitted to the same salinity treatment were clustered together, as they had similar communities present. Tight clustering was found for panels exposed to the 7 salinity treatment; few mortality effects were found at 20 salinity and no effects were found on control panels (33 salinity) (Supplement). Figure 1(a) Settlement panel 1 week after exposure to the salinity 33 treatment showing the high biomass and diverse biofouling community that had developed over 2 years at 1.5 m depth in a marina off Plymouth, UK. (b) Example of a panel 1 week after exposure to the salinity 20 treatment with many biofouling organisms still alive. (c) A panel 1 week after the salinity 7 treatment showing black sulphurous rotting tissues. (d) Typical panel appearance 1 month after exposure to the salinity 7 treatment showing a much reduced fouling community. On panels treated with 7, terebellid worms quickly disintegrated and the erect bryozoan Bugula neritina leached a purple/brown colour into the water. The native ascidian Ciona intestinalis was less reactive when touched with forceps than before the exposure. Neither Dendrodoa grossularia, the most frequent organisms on all panels, nor Watersipora subatra colonies showed immediate visual responses to the treatments. After 1 week, levels of mortality were much more noticeable: for example 142 D. grossularia were counted on the five panels submitted to salinity 7 – after a week 52 of these disintegrated when touched and were clearly dead. Erect bryozoans fell apart when touched with forceps and all of the Ciona intestinalis had fallen off the panels. All of the native ascidian Ascidiella mentula were killed by the salinity 7 treatment and had lost colour with flaccid tests filled with a dark liquid of rotting tissue. Most organisms exposed to the 33 or 20 treatments survived (Fig. 1). More grid squares with bare panel or biofilm were counted on all panels treated with salinity 7 (Table 1). All W. subatra individuals were dead after a week with dark slime covering the panels and the distinct odour of rotting organisms. In the salinity 20 exposures, C. intestinalis were less responsive immediately after treatment. After 1 week, 50 % of W. subatra colonies were dead, of a total of 60 D. grossularia only two (3.3 %) had died. Many D. grossularia individuals were covered with Diplosoma listerianum, not previously observed. This colonial tunicate is widespread in the United Kingdom and shows rapid reproduction and growth rates (Bullard et al., 2004, 2007; Vance et al., 2009). One month after exposure to the three salinity treatments there were still very clear differences among the treatment groups although some recolonization had begun on the salinity 7 treatment panels (Table 1). Numbers of species and the Shannon–Wiener diversity index show a decrease in diversity after 1 week and a small increase after 1 month for panels exposed to the salinity 7 treatment (Fig. 2). We obtained a steady salinity value of 7 inside our model sea chest when immersed at Millbay marina while flushed with freshwater. This was the minimum salinity we used in an experiment to assess the mortality of fouling organisms attached to PVC panels when exposed to three different salinities – 7, 20 and 33 (control). The salinity 7 treatment was highly effective at killing most of the macrobenthos on the panels, whereas communities exposed to 20 and 33 were largely unaffected. There was some recolonization of bare substrata on the panels after 1 month, thus this treatment would be best carried out on sea chests before a vessel leaves port, if she is destined for another biogeographic region. 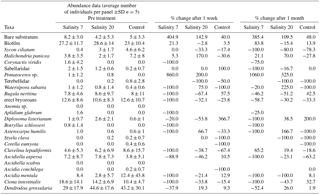 Table 1Average number of biofouling individuals per panel subjected to treatment with salinities of 7, 20 and 33 (control), showing % change in abundance after 1 week and after 1 month. 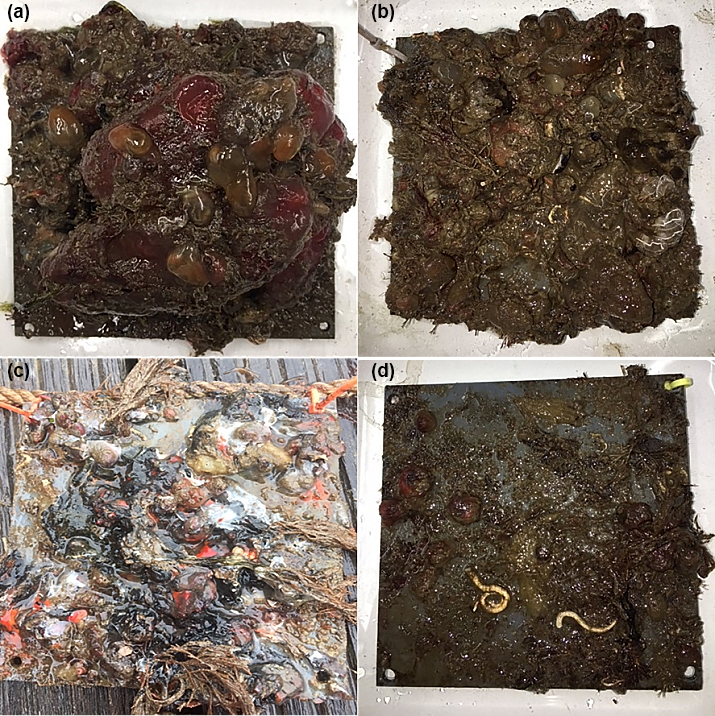 Figure 2(a) Average number of species (S) and (b) Shannon–Wiener diversity index (H′) of 2-year-old biofouling communities developed on PVC panels at 1.5 m depth in a marina off Plymouth, UK. Panels exposed to salinities of 7, 20 and 33 (control) before treatment (ST), immediately after exposure (AF), 1 week after (1W) and after 1 month of exposure (1M). Error bars are ±SD, n=15. Freshwater exposure is an efficient way of controlling sublittoral marine fouling organisms as most suffer osmotic stress (Moreira et al., 2014; Quinton, 2014; Minto, 2014; Jude and Dunphy, 2017). Most organisms were killed by our two hour treatment with a salinity of 7. For example, although D. grossularia had only 38 % mortality, all the non-native W. subatra were all killed after 1 week. After 1 week, many dead, rotting organisms were seen, which then fell off the panels leaving bare space and revealing an understorey of organisms that were previously obscured, such as Pomatoceros sp. (Table 1). Of the two most common species found in this study, D. grossularia and C. intestinalis, the first is a small, robust tunicate, while the second is a large, soft and highly contractile tunicate. Their bauplan possibly contributed to their differing vulnerability to the treatment. After 1 month, new Clavelina lepadiformis had colonized along with small erect bryozoans and W. subatra colonies (Table 1). Thus flushing sea chests with freshwater would be an effective treatment for removing biofouling but will be time-dependent, with new recruitment occurring within 1 month. For vessels which stay for long periods in berth we suggest low salinity flushing of sea chests is applied shortly before vessels depart for the next port of call. Very high levels of mortality occurred in mature biofouling communities subjected to 2-hour treatment with a salinity of 7, although some Dendrodoa grossularia were resilient. Low salinity treatments can be an efficient way of minimizing biofouling from ship sea chests, and offer a promising tool to be incorporated in vessel operation. This would be an environmentally friendly biosecurity tool for minimizing and controlling ship sea chest biofouling that is simple and would not cause undue delay or costs. Limitations of this study are related to its representativeness of only one geographic area, to the fact that the composition of the fouling community can be highly diverse with some organisms being more adjustable to unfavourable conditions than others and also to the static conditions faced by the organisms during their development in the marina which differ from a ship sea chest underway. The data set is part of an ongoing PhD project and not currently available in a public repository. The supplement related to this article is available online at: https://doi.org/10.5194/os-14-661-2018-supplement. MCTdC concieved the experiment design and development, and worked on the species identification, data analysis, manuscript writing and final draft; TV conceived the experiment design, contributed to the experiment development, the species identification and manuscript writing; AY contributed to the species identification and manuscript writing; TF contributed to the experiment development and manuscript writing; JH-S contributed to the data analysis, manuscript writing and critical revision. This article is part of the special issue “Shipping and the Environment – From Regional to Global Perspectives (ACP/OS inter-journal SI)”. It is not associated with a conference. Batista, W. R., Neves, M. H. C. B., Coutinho, R., Lopes, C. C., and Lopes, R. S. C.: Glicerofosfolipídios sintéticos para uso como aditivo biocida em tintas anti incrustante, Química Nova, 38, 917–923, 2015. Bremekamp, M.: Tidal Propagation in Plymouth Sound and Tamar Estuary, Master of Science, Faculty of Science and Technology, Plymouth University, Plymouth, UK, 2012. Bullard, S. G., Whitlatch, R. B., and Osman, R. W.: Checking the landing zone: Do invertebrate larvae avoid settling near superior spatial competitors?, Mar. Ecol. Prog. Ser., 280, 239–247, 2004. Bullard, S. G., Lambert, G., Carman, M. R., Byrnes, J., Whitlatch, R. B., Ruiz, G., Miller, R., Harris, L., Valentine, P. C., and Collie, J. S.: The colonial ascidian Didemnum sp. A: current distribution, basic biology and potential threat to marine communities of the northeast and west coasts of North America, J. Exp. Mar. Biol. Ecol., 342, 99–108, 2007. Carlton, J., Reid, D. M., and van Leeuwen, H.: The role of shipping in the introduction of nonindigenous aquatic organisms to the coastal waters of the United States (other than the Great Lakes) and an analysis of control options, Report to US Coast Guard, Washington, D.C., 1995. Castro, M. C. T.: International Maritime Organization (IMO) Guidelines for the control and management of ships' biofouling to minimize the transfer of invasive aquatic species, X BIOINC, Instituto de Estudos do Mar Almirante Paulo Moreira, Arraial do Cabo, RJ, 2014. Castro, M. C. T., Fileman, T. W., and Hall-Spencer, J. M.: Invasive species in the Northeastern and Southwestern Atlantic Ocean: A review, Mar. Pollut. Bull., 116, 41–47, 2017. Clarke, K. R., Somerfield, P. J., and Gorley, R. N.: Clustering in non-parametric multivariate analyses, J. Exp. Mar. Biol. Ecol., 483, 147–155, 2016. Collin, S. B., MacIver, K., and Shucksmith, R.: A biosecurity plan for the Shetland Islands, NAFC Marine Centre, Shetland, 55 pp., 2015. Coutts, A. D. M. and Dodgshun, T. J.: The nature and extent of organisms in vessel sea-chests: A protected mechanism for marine bioinvasions, Mar. Pollut. Bull., 54, 875–886, 2007. Coutts, A. D. M. and Taylor, M. D.: A preliminary investigation of biosecurity risks associated with biofouling on merchant vessels in New Zealand, New Zeal. J. Mar. Freshwater Res., 38, 215–229, 2004. Davidson, I., Scianni, C., Hewitt, C., Everett, R., Holm, E., Tamburri, M., and Ruiz, G.: Mini-review: Assessing the drivers of ship biofouling management – aligning industry and biosecurity goals, Biofouling, 32, 411–428, 2016. Dobretsov, S., Abed, R. M., and Teplitski, M.: Mini-review: Inhibition of biofouling by marine microorganisms, Biofouling, 29, 423–441, 2013. Faÿ, F., Linossier, I., Carteau, D., Dheilly, A., Silkina, A., and Vallee-Rehel, K.: Booster biocides and microfouling, Biofouling, 26, 787–798, 2010. Frey, M. A., Simard, N., Robichaud, D. D., Martin, J. L., and Therriault, T. W.: Fouling around: vessel sea-chests as a vector for the introduction and spread of aquatic invasive species, Manage. Biolog. Invas., 5, 21–30, 2014. Gollasch, S., Macdonald, E., Belson, S., Botnen, H., Christensen, J., Hamer, J., Houvenaghel, G., Jelmert, A., Lucas, I., Masson, D., McCollin, T., Olenin, S., Persson, A., Wallentinus, I., Wetsteyn, L. M. J., and Wittling, T.: Life in Ballast Tanks, in: Invasive Aquatic Species of Europe. Distribution, Impacts and Management, edited by: Leppäkoski, E., Gollasch, S., and Olenin, S., Springer Netherlands, Dordrecht, 2002. Growcott, A. K. D. and Georgiades, E. : Literature review: In-water systems to remove or treat biofouling in vessel sea chests and internal pipework, Ministry for Primary Industries, Wellington, 2016. Hearin, J., Hunsucker, K. Z., Swain, G., Gardner, H., Stephens, A., and Lieberman, K.: Analysis of mechanical grooming at various frequencies on a large scale test panel coated with a fouling-release coating, Biofouling, 32, 561–569, 2016. Jute, A. and Dunphy, B. J.: The potential efficacy and application of freshwater and hypersaline immersion to control the spread of a marine invasive species, Biol. Invas., 19, 1137–1141, 2017. Leach, A.: Testing the efficacy of heated seawater for managing biofouling in ship's sea chests, Bachelor of Marine Science, School of Biological Sciences, University of Wollongong, Wollongong, 2011. McCann, L. D., Holzer, K. K., Davidson, I. C., Ashton, G. V., Chapman, M. D., and Ruiz, G. M.: Promoting invasive species control and eradication in the sea: Options for managing the tunicate invader Didemnum vexillum in Sitka, Alaska, Mar. Pollut. Bull., 77, 165–171, 2013. Minto, O.: The influence of acute hyposaline exposure on biofouling assemblages, BSC, BSC thesis, Plymouth University, Plymouth, 2014. Moreira, P. L., Ribeiro, F. V., and Creed, J. C.: Control of invasive marine invertebrates: an experimental evaluation of the use of low salinity for managing pest corals (Tubastraea spp. ), Biofouling, 30, 639–650, 2014. Murray, C. C., Pakhomov, E. A., and Therriault, T. W.: Recreational boating: a large unregulated vector transporting marine invasive species, Divers. Distribut., 17, 1161–1172, 2011. Piola, R. F. and Hopkins, G. A.: Thermal treatment as a method to control transfers of invasive biofouling species via vessel sea chests, Mar. Pollut. Bull., 64, 1620–1630, 2012. Price, A. R. G. and Readman, J. W.: Booster biocide antifoulants: is history repeating itself? Late lessons from early warnings: science, precaution, innvation. Part B – Emerging lessons from ecosystems, in: Vol. 12, The European Environment Agency, Publications office of the European Union, Luxemburg, 297–310, 2013. Quinton, E.: Control of native and non-native marine invertebrates: chronic hypo saline treatments for managing biofouling, BSC, BSC thesis, Plymouth University, Plymouth, 2014. Rolheiser, K. C., Dunham, A., Switzer, S. E., Pearce, C. M., and Therriault, T. W.: Assessment of chemical treatments for controlling Didemnum vexillum, other biofouling, and predatory sea stars in Pacific oyster aquaculture, Aquaculture, 364, 53–60, 2012. Ruiz, G. M., Carlton, J. T., Grosholz, E. D., and Hines, A. H.: Global invasions of marine and estuarine habitats by non-indigenous species: Mechanisms, extent, and consequences, Am. Zool., 37, 621–632, 1997. Schultz, M., Bendick, J., Holm, E., and Hertel, W.: Economic impact of biofouling on a naval surface ship, Biofouling, 27, 87–98, 2011. Scianni, C., Brown, C., Nedelcheva, R., and Dobroski, N.: Hull husbandry practices and biofouling management of vessels operating in California, in: IEEE 2013 Oceans, San Diego, 2013. Titus, J. M. and Ryskiewich, B. S.: U.S. Patent No. 5,322,569, US Patent and Trademark Office, Washington, D.C., 1994. Vance, T., Lauterbach, L., Lenz, M., Wahl, M., Sanderson, R. A., and Thomason, J. C.: Rapid invasion and ecological interactions of Diplosoma listerianum in the North Sea, UK, Mar. Biodivers. Rec., 2, e59, https://doi.org/10.1017/S1755267209000815, 2009.